The Great Islay Swim. In a week in July 2017 they plan to swim all around Islay. Starting from Ardbeg they will swim clockwise around Islay in seven days. Swimming between 4-8 hours a day and covering around 15-20 kilometres per day. Pulling a whisky cask they are planning to fill with whisky from all the distilleries (similar to the Islay Pillage a number of years ago), which will later be bottled and sold. And they’re fundraising for the RNLI. I’m getting a bit nervous now. Soon I’ll be leaving for my first Islay visit in a year, the longest gap between visits for over a decade. The reason for the long gap was the heart surgery I had in October 2016, the run-up to it as well as the following (and to an extent still ongoing) recovery. This visit is of course for the Walk Islay walking week, a goal I’ve been building up to over the last few months. When I started with a rehabilitation class in December I had a review with the nurse and she asked me about fitness goals I had. My first one was to start with some light jogging in January (which I did and have since increased), the second one was participation in the walking week (now coming up). The Walk Islay event started in April 2003, kind of a chance encounter for me as I only found out about it while I was on Islay for a long Easter weekend. I joined one of the walks (walking north from Saligo Bay, a walk I’ve since repeated several times, on my own, with my late mother as well as most recently with my sister) and very much enjoyed it. So I returned the following year for the full week (taking my mother with me as well). Since then I’ve participated in every single walking week, as far as I know by now I’m the only person who has completed at least one walk in every single walking week. Which was obviously further motivation to return this year in order not to break the chain. I don’t know yet how many of the walks I will participate in this week, some of it I’ll decide on short notice depending on weather and how I feel. Starting point will be the walk on the Oa on Sunday, a walk I’m planning to complete. After that I might take a break on Monday, depends on how tired I’ll be. I’d like to go on to the walk to Bholsa on Tuesday, I’ll probably make that dependent on how the weather looks. Wednesday is Colonsay day, after not having been for a while I’m currently thinking of going. Thursday would be Beinn Bheigier, normally I’d go, this year I’m probably only going to go if the weather is fantastic. Not sure yet if I’ll have enough energy to go on a bad day. Friday is Jura day, I’m planning to join that walk fitness permitting. Of course I also need to visit some of the beaches, drop in at some of the distilleries and hopefully meet as many old and new friends as possible. If you’re around please get in touch and I’ll see what I can do. 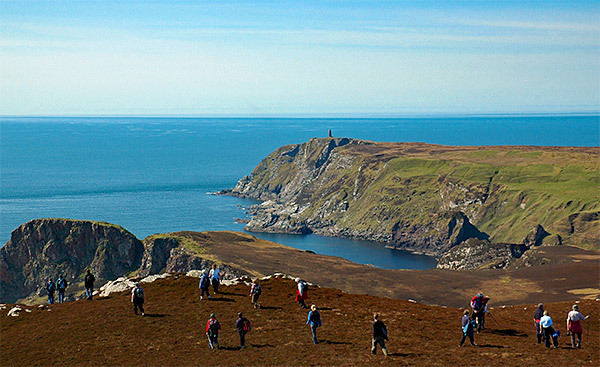 If you’re thinking of joining one of the walks check the the Walk Islay walking week website, all the details are there. It will be good to be back. Sorry, fun’s over. Admittedly pretty much all of you spotted immediately that the Haggis farm on Islay was an April Fools. But just in case you had any niggling doubts it might be true after all, it isn’t. No Haggis farm on Islay any time soon. Islay Ales announced the opening of an Artisan restaurant. Although it seems it was destroyed in a storm just hours later. If there are any other Islay related ones I have missed please let me and other readers know via the comments. 01/Apr/2008: Bridge to Link Islay and Jura! 01/Apr/2009: Blue Whale Spotted on Islay! 01/Apr/2011: James Bond Movie to be filmed on Islay? Islay farmers are well known for their excellent beef, pork and lamb. The fresh sea air and salty grass certainly helping with the nice taste of the meat. Soon there will be a fourth variety of meat coming directly from Islay: Haggis. A Haggis farm is to open on Islay today. The farm will start with 100 Haggis, but expansion plans have already been approved to grow this to 1,000 Haggis. Being located on Islay the expectation is the Haggis meat will have a salty and peaty taste influence. Especially over the winter (and therefore in the prime season just before Burns Night) the grass will be complemented with draff from the whisky distilleries, meaning the Haggis will go even better with a good Islay whisky. It is expected that the Haggis will thrive on this rugged land, finding plenty of food (as already mentioned supplemented with the draff from the distilleries during the harsh winter months) and growing and fattening quickly. The uneven and hilly landscape is their natural habitat, so they will feel right at home. Initially most of the sales are expected to be local on Islay, but as its fame spreads the owners expect to export to the mainland and even internationally. First enquiries by international importers have already been received even before the farm started operating. I hope you enjoyed it, I found it quite fascinating watching it swirling around. 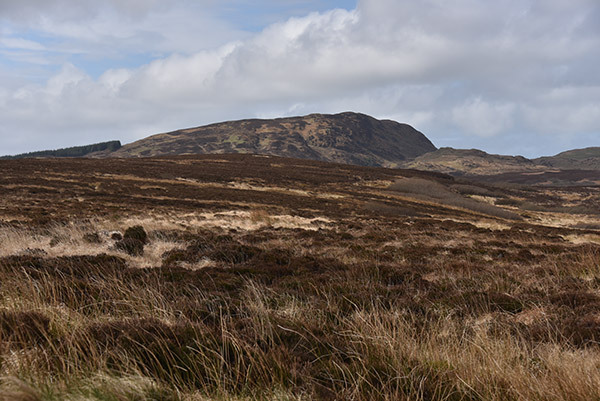 Not on the RSPB Islay blog but on the RSPB Liverpool blog I came across an entry about a birdwatching visit to Islay: Holiday to Idyllic Islay, 19th to 23rd February 2017 – Led by Aquila Ecology. The iLaddie decided to perform an experiment: Blending Bruichladdich LaddieMP5. He claims it was successful. I’ve mentioned Kate’s (who I haven’t met in person yet) work and Islay visits as well as Anna (who I’ve met a couple of times while she was working and living on Islay) a couple of times, now Anna writes about Kate’s work: Inspired by Islay. An interesting write up about a Bruichladdich whisky tasting in Ireland: The sound of Islay (no, not the Sound of Islay, that’s something different). As if by coincidence the next one is a quick jump across the Sound of Islay to Jura for A day in the life “Rachael jones”. Heiko is a regular visitor to Islay and also quite fond of burgers (I like that man, Islay whisky and burgers, he’s certainly in my good books). He has recently published a burger book and is celebrating with a Surf’n’Turf Burger. Jake on the Distiller Blog claims The Debate Over Terroir Rages Away on Islay. Which side are you on? Gordon Yates has been back on Islay again, you can read about it in Forty Shades of Grey and Hunter and Hunted. Lynne writes about her visits to Ardbeg Distillery, Isle of Islay, Scotland and Caol Ila Distillery, Isle of Islay, Scotland. She also visited the Finlaggan Cross, Eileen Mòr, Isle of Islay, Scotland as well as The Kildalton High Cross, Isle of Islay, Scotland. Julia Garner has a bunch of posts about her Islay visit in February, including Islay beach finds, Saligo Bay – two versions, Islay wildlife highlights and Singing Sands and otters. On the Port Ellen Primary School blog we can read about the My Place Photography Competition. They also celebrated Burns Day. I’ve watched them many times on Islay, in particular at Ardnave and at Kilchoman. Scotland’s Nature writes Why the chough needs a champion. An Islay blogging roundup wouldn’t be complete without a mention of the Islay Birds blog (which by the way will be 10 years old in two months). While Ian (who writes the blog with the help of dozens of contributors, even I have been able to contribute a few times I’m immensely pleased to say) was away for three weeks James ran the blog for him. Some of the highlights include a Cackling Goose, a possible Gyr Falcon and a variety of birds including a Glaucous Gull.